“Behind the Curtain,” the opening salvo of Joe Deninzon & Stratospheerius’s fifth album Guilty of Innocence, immediately informs us we’re not in Kansas anymore. It sets the stage for a high energy excursion through many stylistic musical variations. Most tracks are build around well designed and infectious riffs. They are embellished with textures that satisfyingly continue to reveal new facets on repeated listenings. A cover of Muse’s “Hysteria,” is the advance single. It’s a good choice for the band and they add plenty of rhythmic flavor compared to the original. Their arrangement begins with vocalizing reminiscent of the introduction to Cream’s “White Room” before Stratospheeriius descends into a frenetic streamlined groove and “I want it all, I want it now.” chorus. Joe Deninzon’s electric violin explorations with liberal use of effects has often garnered comparisons to Jimi Hendrix, but fusion fans will know the historical straight line actually leads to Jerry Goodman who during his tenure with Mahavishnu Orchestra was the groundbreaker for the instrument in the rock idiom. Another touchstone might be the artisan of arpeggio and great granddaddy of all “rock stars,” Niccoló Paganini. Deninzon and company’s virtuosity is undeniable but their arrangements smartly favor the integrity of the song. Like the best heavy rock tunes of the past soloing is integral to structure rather than presented for the sake of blowing. It’s progressive music that’s not afraid of a catchy chorus. Even the 12 minute closing track “Soul Food” is a well crafted multi-tempo road trip. It ventures into magnum opus territory where 70’s rockers Kansas were at home, and features guest artist guitarist Alex Skolnick. There is plenty to like here. “Behind the Curtain” opens with choppy talkbox squacks. “Affluenza” rides over a wha-guitar rhythm, and gets a funky synth solo by Renaissance’s Rave Tesar, who also Mastered the album. The band slyly draws us in with familiar sonic references. The aforementioned “Face” gives a wink to the mid-section arabesques of Blue Oyster Cult’s “(Don’t Fear) The Reaper,” and “Game of Chicken” has a jazzy Steely Dan aura, along with a prophetic lyric than we’d prefer not to be experiencing at the moment. The penultimate track, “Dream Diary Cadenza,” is where all the stops, chops and stomp boxes are pulled out. It references Deninzon’s 2015 work Dream Diary, A Concerto for Seven-String Electric Violin and Orchestra. It’s ornamental melodic flourishes are treated with looping and swooping repeats and spasmodic choppy effects. If we’re tempted to say Joe wrote the book on contemporary violin, it’s because he did. PLUGGING IN: A Guide To Gear and New Techniques for the 21st Century Violinist (Mel Bay Books) is a primer for amplified and treated playing. Guilty of Innocence is an exceptionally rewarding listen. It’s an engaging set of well written and recorded tunes, many of which (like the grooving “Take Your Medicine”) should be excellent additions to Stratospheerius’s live shows. Stratospheerius has a full dance card this fall with a run of shows in the American mid-west. 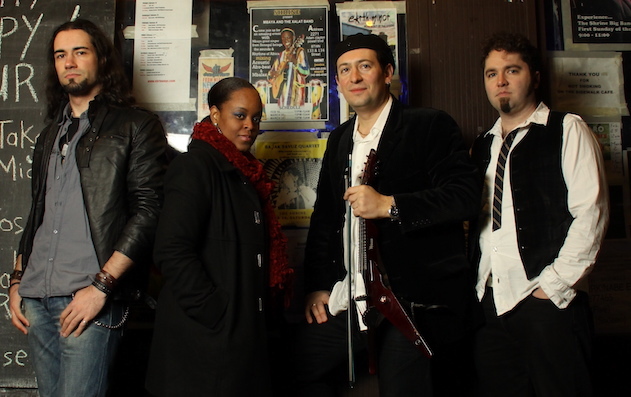 Later in the year Deninzon will join the string group Sweet Plantain for dates that will include several shows with progressive stalwarts Renaissance on their Symphonic Journey tour. Vocalist Annie Haslam mounted a successful Indie Go-Go campaign to fund the addition of a 10 piece chamber orchestra to the stage line-up, giving fans a chance to hear the full arrangements they remember and love. There will be 4 performances including New York City’s Town Hall on Oct 28, 2017. One performance will be filmed and recorded for 2018 DVD/CD release.